An endless sight of Purple Hills……. I just wanted to say, how incredibly cool you look in the second picture. I love how pretty everything is, all I can see is fields of corn. amazing shots ! you’re so lovely, I like the dress a lot. magical shots, the dress is beautiful!!!! That outfit looks so comfy, and it’s really beautiful too, it suits your natural background perfectly. That dress is fantastic, love the color. Love the background! You have the best style! amazing! love the colors of the outfit and the shoes and sweater are great! I love your outfit and these pictures are amazing! Lovely outfit and pictures! so romantic and chic. i love this look! it’s so fall-like with the deep rich colours, chunky knit and thigh highs-love it! Such pretty pics, I love heather! That dress is very cute too. on you, everything become fabulous! i just found your blog on fashion jinx and wow! your style is everything i wish mine was haha. i love the knee high socks & boots combination. your style is so effortless; i love it! One of my favourite outfits from you, etheral but grungy, love it! Love the thigh highs…you have a beautiful sense of style. this is awesome. the jeffrey campbells with thigh highs! Och, these photos are magic! WOW STUNNING photos lady love! the boots are so LUST WORTHY too…need them! beautiful photos! ahhh that dress LOVE! these are superb pics! 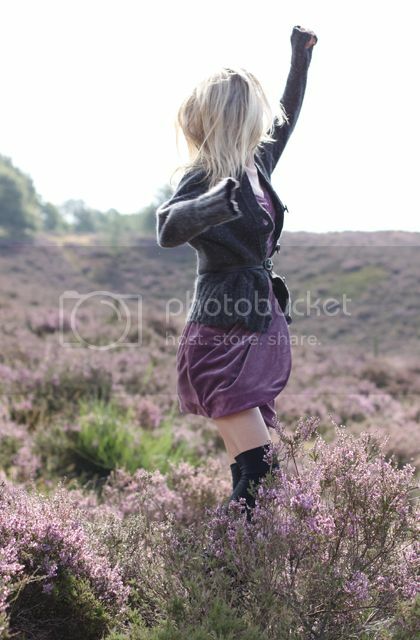 the clothes, the sun, lavenders and your hair!! beautiful photos! that scenery you chose for this outfit is perfection! Lovely blog! I am your new fan! seriously amazing photos! i love all of the textures in your outfit, and you’ve made me more excited because i just bought some thigh highs that i cannot wait to wear! editorial material chantal! i loved the outfit btw! soooooo ridiculously gorgeous. you have wonderful style. take care!! Echt een hele speciale jurk en staat je erg mooi :)! de hei is zo mooi als hij in bloei staat! hoe lang blijf je nog in nederland? You find the cutest things at H&M! great photos! Oh WOW, this is a great post & you have the most gorgeously beautiful site here. I had to stop by to leave this comment for you – and to say hello of course ! Your posts are creative and original and you have interesting pictures. It’s all perfect ! Thank you for sharing your site and best wishes… Happy weekend…. So lovely, I LOVE PURPLE. Gotta love H&M!!! Those pictures are so lovely! coldplay-purple hills! ouh, you’re so pretty. such a perfect photographs. i lovvvveeeeeee it so much! Lovely look girl! ..and the photos are beautiful! Heeeey, is that in the neighboor of Arnhem? Cause it looks like that and it’s where I live (: You’re great! And so is your style.